Is Daniel Hernandez Jr. Changing Obama's Mind About Federal Marriage Equality? By now you surely know that Daniel Hernandez Jr. is the intern credited with saving Rep. Gabrielle Giffords’ life after she was shot in the head in Tucson, Arizona earlier this month. And certainly you know that by all accounts, Hernandez ran toward the gunshots when they rang out, rather than away from them. If you’re a Unicorn Booty reader, you also have picked up on the fact that Hernandez is gay. This is relevant because Hernandez has been getting an awful lot of face time with the Obamas lately. 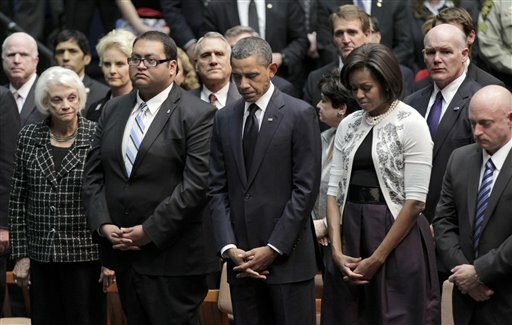 At the televised Tucson memorial service, he was seated next to the president himself. And tomorrow, on Hernandez’s 21st birthday, he’ll celebrate seated next to Michelle Obama, rather than out in a bar. All of this up close and personal time with America’s first family is noteworthy, especially since the president spoke last month about his evolving attitude toward marriage equality. It certainly stands to reason that this highly publicized and nationally recognized gay, hispanic, American hero’s continued relationship with our first black president and his family would dip a toe or two into talk of marriage equality, the controversial DREAM Act, and the continued evolution of civil rights in our nation. And while Obama has several openly gay officials in the top spots of his team, one can imagine it would be difficult to gently elbow their boss on the subject of the injustice of the discrimination they face as gay Americans. Hernandez, while obviously respectful to his president, isn’t on the boss’ payroll, giving his experience extra candor and value. No matter how you slice it, Daniel Hernandez’s heroism being lauded by the entire country can only help gay rights push forward toward full equality. Federal marriage equality will happen in our lifetime. The question is simply whether our current president or which of his successors will be brave enough to push forward full equality for all Americans. Do you think Hernandez is a positive influence on the President?